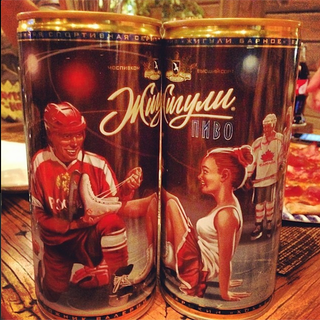 The Washington Post's Rick Maese brings us this photo of Russian beer that can be purchased at the Sochi Olympics. As Maese points out on his Instagram page, that appears to be a Russian hockey player stealing a pretty ice skater from the defeated Canadian hockey team. You may question Russia's competence as an Olympic host country, but don't you ever question its swaggger.